Villair have been arranging weddings abroad and honeymoons for over 25 years. With the average cost for a UK wedding now easily exceeding £20,000, it is not surprising that cost conscious couples are opting to combine their wedding abroad with their honeymoon. Whilst value for money is important, we strongly recommend that couples use our expert knowledge and advice to obtain free Wedding package options, upgrades, resort credits, sometimes free accommodation for the bride and other bonus offers available from reliable independent specialist Operators. The time of the year and budget will be factors in the choice of venue. Popular destinations reasonably close to home are, Cyprus - Aphrodite’s romantic island, Greek islands including Santorini, Turkey, Italy including Sardinia & Sicily, Malta plus winter weddings in Austria or Iceland & Lapland.Traditional long haul favourites are the Islands of the Caribbean & the wonderful Indian Ocean island of Mauritius. Thousands of couples also choose to tie the knot at one of the unique chapels in Las Vegas. More unusual ceremonies are held at Couples resorts in Jamaica where a new tree house Wedding package is ideal for adventurous couples requiring a secluded jungle setting. Breezes Runaway Bay, Jamaica offers scuba divers the chance to exchange rings on the ocean floor with exotic fish as witnesses. African safari weddings are available with stays in riverbank lodges or luxury tents with a Game drive on the Wedding day. South Africa’s malaria free Game Reserves combine well with a Garden Route tour after a few days in Cape Town. Other more unusual destinations for weddings abroad are, at the top of the Empire State Building or in Central Park at Christmas or on Sydney Harbour Bridge overlooking the famous harbour & Opera house. In Sri Lanka the Bride & Groom can arrive at the ceremony on dressed elephants followed by an intimate dinner for 2 on the beach. Other options are a Canadian winter wonderland in Banff/Lake Louise, or barefoot on the beach at Hamilton Island, in the heart of Australia’s Barrier Reef. We can even arrange weddings onboard numerous Cruise ships. Other weddings with a difference take place in Canada where bear watching followed by an Alaskan Cruise are popular May to September, in New Zealand where superb scenery and exciting outdoor activities combine well with a flight stop in a quiet Pacific island, or in Brazil’s stylish Copacabana Palace Hotel in Rio. 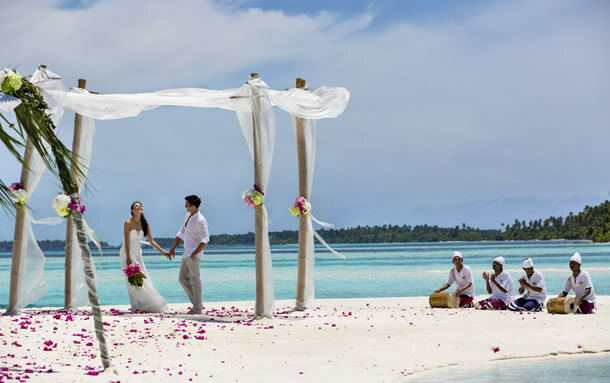 Villair will ensure that the correct legal documentation is completed and that sufficient time is spent in the chosen country before the Wedding takes place. It is necessary to plan weddings abroad well in advance. We offer a Wedding list service enabling guests to contribute to your Honeymoon or extras such as a hot air balloon ride, a special romantic champagne dinner or perhaps a relaxing spa treatment. We look forward to assisting couples create their own 'Special Day' within a trip of a lifetime.